Jacob Duke has come back to Braketon­—a sleepy, backwoods town bordering Dover, the mental institution where he spent his formative years. Jacob's intention is to enjoy Braketon's woods and water for the first time as a free man, but he soon discovers that Dover isn't through with him yet. Driven by a curse that compels him to grant any wish he hears, Jacob is drawn back into his disturbing former life by a young boy's desire to see his own father dead. Complicating things are Lori Nelson, Jacob's friend-with-benefits who continues to put new boyfriends in his path, and Motown, Jacob's friend from his years at Dover, who carries a secret that rocks Jacob's foundation and makes him question his own morality. 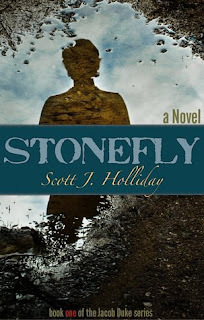 Stonefly is a suspense thriller that rockets to a surprising, but satisfying end. Stay tuned for the second book in the series, entitled Broken Horizon. STONEFLY has to be one of the most unusual books that I have had the pleasure of reading. Jake spent his youth in a mental institution after he killed a classmate to grant another's wish. He is driven to grant wishes no matter what they might be due to a curse that he inherited from his father. This is the only thing that he inherited from the man and Jacob's feelings are rather conflicted about both him and his mother. STONEFLY is written in the first person and normally I find that style rather hard to read. In this case however I found Jacob and his thoughts to be fascinating. The way that he deals with his curse is interesting as he made himself deaf so that he would be able to hear passing people making random wishes. He is still able to grant wishes as he is excellent at lip reading. I found STONEFLY to be a fascinating book and I am sorry that it is over. I even put the book down for a couple days when I got close to end just to make it last longer. I am definitely waiting impatiently for Broken Horizon which is the next book in this series.